Lynton Mortensen of Brisbane, Queensland became the first Australian to complete the Oceans Seven with his 14 hour 14 minute crossing of the Cook Strait today. 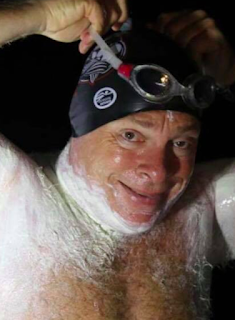 The 54-year-old, nicknamed the Sea Bull, was the 12th person in history to swim across the 14.4 km Strait of Gibraltar (Spain to Morocco in 5 hours 12 minutes in 2016), the 33.8 km English Channel (England to France in 12 hours 35 minutes in 2017), the 35 km North Channel (Northern Ireland to Scotland in 13 hours 49 minutes in 2017), the 32.3 km Catalina Channel (Santa Catalina Island to the Southern California mainland in 13 hours 59 minutes in 2017), the 42 km Molokai Channel (Molokai to Oahu in 14 hours 49 minutes in 2018), the 19.5 km Tsugaru Channel (Honshu to Hokkaido in northern Japan in 9 hours 34 minutes in 2018), and the 29.5 km Cook Strait (North Island to South Island in New Zealand in 14 hours 14 minutes today). Mortensen is raising money for the Children’s Hospital Foundation on his channel crossings in order to help hospitalized children in need and their families. Funds support lifesaving childhood cancer research and purchase of vital new lifesaving equipment for the children. For more information on Mortensen's charity swims, visit his Everyday Hero campaign here.